The unemployment rate fell to 7.0% on the creation of 203k new hires. I don’t think we have to explain the math again. The magnitude of new hires outpaced the increase in labor force size, thereby forcing the unemployment rate down in spite of no actual improvement. 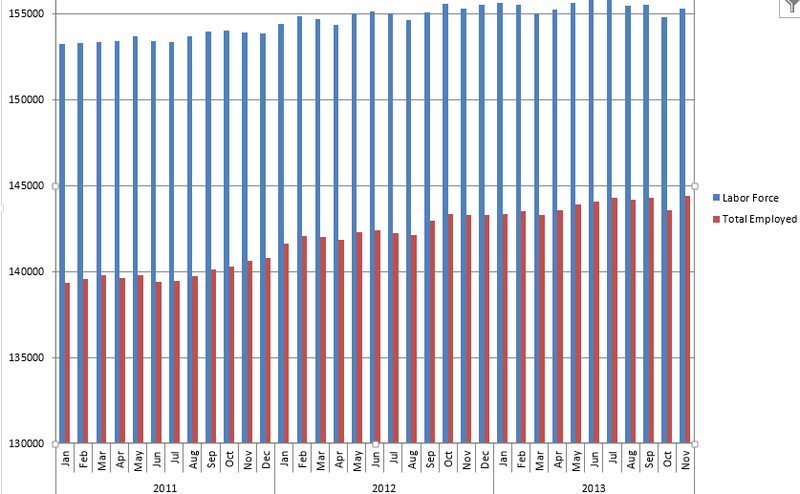 The 203k includes 7,000 government hires, so the private sector only added 196k. We acknowledge that some of the data is a little skewed by the return of Federal workers following the shutdown. Those effects will be out of the system by next month, but the impact was fairly minor and actually provided more benefit than harm to this report. The labor force grew by a respectable 455k in November of 2013, but that was not enough to offset October’s decline of 720k, and we are still below the total labor force size of a year ago. Wages have shown an increase of about 2% which is currently beating inflation. The participation rate popped up by .2, but that keeps it at 63 in all-time low territory and still a huge .6 below November of 2012. The work week got a little longer, but is still range bound. Manufacturing hours, for example, has run between 40.5 and 41 hours per week going back to 2012 with no breakout. We still have over 91 million people out of work, and when those are added to the count used to calculate the rate we are still over 13% unemployment. Here are the most recent Force vs. 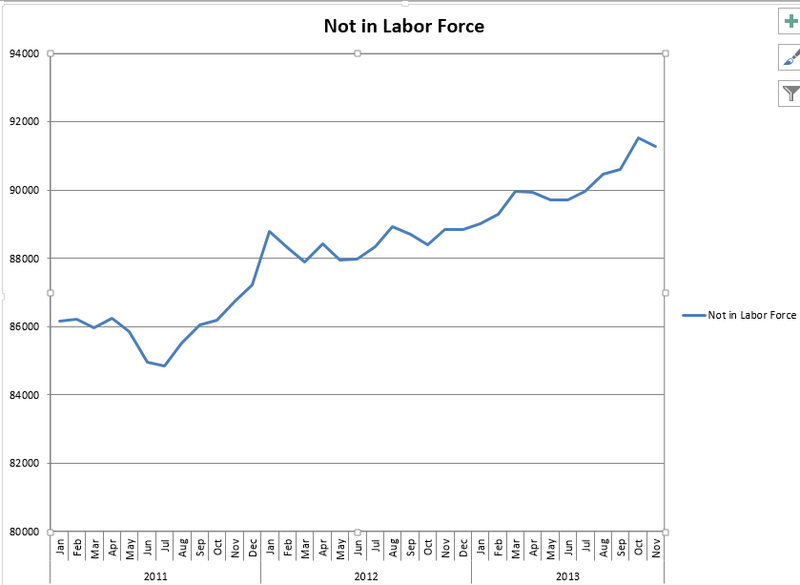 Employed and Not in Labor Force Graphs. Hopefully, this will be the first of reports to start an upward trend. We’ve had a few head fakes like this over the last few years, so here’s to hoping some positives hold and grow. Matt will be going over this report on WBBM Chicago’s Noon Business Hour at 12:10pm on AM780 and 105.9 FM. A link to the podcast will go out later tonight. Merry Christmas and Happy New Year from everyone at Blue World. We’ll see you for the first report of 2014 on Friday, January 10.